The idea for the book you are currently exploring was born during the second edition of an international conference of computational design Shapes of Logic. It was one of the few Polish conferences addressing the subject of computation in design and architecture. 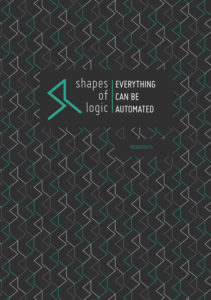 The first edition of Shapes of Logic took place in 2015 and has become a successful platform for exchanging ideas in the fields of parametric design methodologies, evolutionary algorithms, digital fabrication and urban structures. Design Automation – This block shares the knowledge concerning the automation of broadly understood design process. How can computer science improve the way we create ideas and draw plans? What new possibilities are arising thanks to the technological progress? Digital Fabrication and Robotics – Advancement in fabrication process have opened many new paths during previous years. Are we about to face a new revolution in the way we make things? Can automation reach the realm of physicality in architecture and design industries? Visions of the Future – Sociology, Political Science, Philosophy, Economy, etc. What is going to be with us? Are we going to reach radical levels of automation in the perceivable future? If so, how will it affect politics, economy, culture? Or maybe it is all just an illusion? Maybe singularity is actually quite far away? The abundance of exchanged knowledge influenced us to create this monography which introduces a reader to the world of various sides of computational design and its practical applications. We would like to thank all conference participants, sponsors, partners and supporters for the support which let this book and the conference see the sunlight.